The employee handbook is one of your company’s most important documents, providing essential guidance for staff. But how do you create one, what should it include and how can you get your employees to read it? You are not required by law to publish an employee handbook, but employment law does require businesses to communicate all policies and procedures to their staff. Rather than creating a myriad of disparate policies, a handbook collates this information in one central location. It also minimises the risk for misinterpretation and disputes if your business was ever taken to court by an employee. 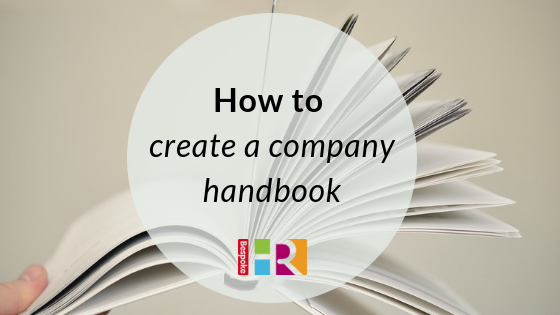 If you’re creating a handbook from scratch, it’s a great way to communicate your brand to new employees. It can also be a useful exercise in creating those HR policies your business needs but may not yet have in place. Your handbook doesn’t need to be produced by a legal professional, but it’s a good idea to have your HR contracts and policies checked over by an HR / employment law professional. Company background: keep it short and sweet. Give employees a snapshot of your company, its ethos and achievements. Benefits packages: such as pensions, childcare vouchers and other incentives your business offers. Training and development schemes: appraisals, training opportunities and feedback. Key company contacts: those who take on responsibility for HR. You don’t need to spend money on designing and printing a fancy document. You can create the handbook in word using your company logos and headers, and then save it to a PDF (so it’s not editable). There are also some great tools around to make professional looking designs, such as Air Mason or free online templates. Use pictures to break up the text, but don’t forget to check copyright licensing if you’re taking images from the internet. If it seems like a lot of hard work, you can also outsource the entire job. Most outsourced HR providers can provide you with a handbook (or template) for a one-off fee. Remember to use simple language, avoiding jargon or acronyms. Staff are more likely to read an easy to digest document. The Plain English Campaign has some great suggestions for using easy-to-read language in corporate documents. Don’t forget to include a contents or index page so that staff can find what they are looking for. Make sure the handbook is part of the new employee induction process. Provide them with a printed version and let them know where it’s saved. You could consider holding a quiz as part of the induction process to check your new starter has read it. If you’re introducing a handbook for the first time, brief staff on its contents and why they need to read it. Your employee handbook is your company culture and brand, so make sure it reflects everything you want your business to be. We can help with handbooks, get in touch for a chat to find out how.